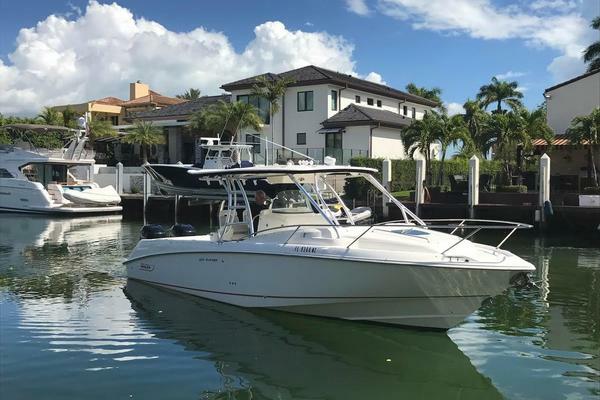 Premium comfort and features come standard on this beautiful 285 Conquest so you can enjoy active day cruises, serious fishing runs and impromptu overnighting. Offshore trips are a pleasure thanks to design details that maximize helm visibility, seating comfort, storage space and more. The boats welcoming cabin sleeps four with a plush forward dinette/v-berth and a mid cabin double. A deluxe galley and private head deliver the comforts of home when taking family or friends for a cruise. Equipped with full Garmin electronics and a bow thruster for full control when docking and departing, it is the perfect boat for ‘seizing the moment’. Boston Whalers are purposeful craft, allowing their owners to indulge their passions with determination and grace. Aboard these legendary craft, you become the legend. West Florida Yachts would love to guide you through a personal showing of this 28' Boston Whaler 285 Conquest 2013. This yacht for sale is located in Mahone Bay, Nova Scotia and priced at $164,000. For a showing please contact us by filling out the form on this page and we will get back to you shortly! The thoughtfully appointed 285 Conquest offers premium comfort and features for active day cruises, fishing runs and overnighting. Improvements abound to make your offshore trips a pleasure, including better helm visibility, an enhanced port lounge and more storage throughout. The boat's elegant cabin sleeps four with a plush forward V-berth/dinette and a mid-cabin double berth. Optional HDTV, a deluxe galley and private head deliver the comforts of home when taking family or friends for a cruise. When you're not entertaining a crowd in the generous cockpit, go out and find the big fish -- the 285 Conquest is fully equipped for offshore fishing. Three hard-top options and numerous innovations make the 285 Conquest the perfect boat for seizing the moment.